Lantana x hybrida ‘New Gold’ is a cross between a Lantana camara and a Lantana montevidensis. This plant has a great show of flowers that last from spring till frost, the flowers a golden yellow color and are great at attracting butterflies into the garden. 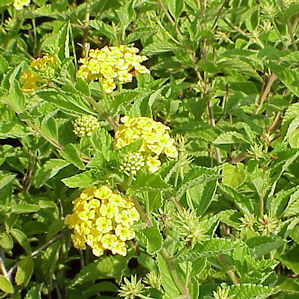 Lantana is drought tolerant, salt tolerant, deer tolerant, is very adaptable and had outstanding heat tolerance. This variety has a reduced fruit set due to near sterility to encourage a longer and more profuse bloom. ‘New Gold’ can grow up to 18″ high and 3 feet wide.